The next Boulder Real Estate Meetup will be held at The Riverside (NE corner of Broadway and Arapahoe) at 6pm on January 23rd. You're invited. After September's floods, the real estate landscape in Boulder changed. Virtually overnight, listing agents began touting unaffected properties as having survived the flood unscathed. 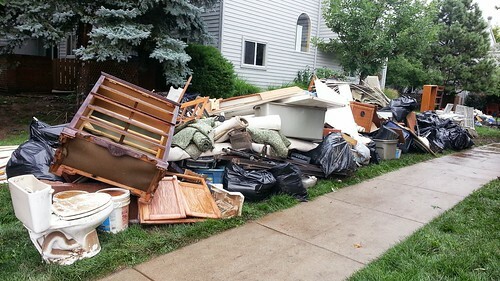 Meanwhile, many basements and lower levels experienced varying degrees of flood damage and owners wondered what to do. I've received many phone calls and emails asking about extent of responsibility, permitting, and liability. Time to call in the experts. Brandon Apple from Mold Inspection Sciences will be our feature presentation at January's Meetup. To help complete the picture, I also expect to have insurance and reconstruction specialists available to answer questions. We'll also be discussing market conditions and I'll have the latest House Einstein report available (with full year 2013 data). It's not usual for buyers and sellers to meet at these events, so please bring your pocket listings and buyers. Who Should Attend? Typical attendees include buyers, sellers, investors, property managers, staging consultants, architects, lenders, Realtors, and inspectors. If you have an interest in real estate in the Boulder area, you're invited. Please RSVP. Feel free to bring your business cards but remember, this is a pitch free event. The goal is to facilitate a healthy discussion of local real estate issues and foster community.